The Watson CPA Group and Jason Watson have released the 2019 Edition of Taxpayer’s Comprehensive Guide to LLCs and S Corps. 330 pages of pure pleasure! We went through a mini slamma jamma revision shortly after the Tax Cuts & Jobs Act of 2017 including Section 199A deductions for small businesses, and now we just completed our major revision following IRS Proposed Regulations 1.199A and other mid-year after the dust has settled analysis. Riveting! We have several examples showing how the Section 199A works, why S corporations remain a great tool for tax savings and why reverting to a C corporation is a bad idea. We also discuss entity formation, S Corp elections, reasonable shareholder salary and business tax deductions. Frankly the Section 199A stuff is only about 40 pages of the material… the rest is good ol’ fashion business stuff! If you buy our 330-page book and think that we didn’t help you understand small business tax law or the benefits of S corporations, let us know. We never want you to feel like you wasted your money. If you are ready to add some insightful reading into your day, click on one of the preferred formats. Amazon is processed by Amazon, and the PDF is safely processed by ClickBank who will email you the PDF as an attachment. This information is also incorporated into our book including examples and calculations. Happy Happy Joy Joy! 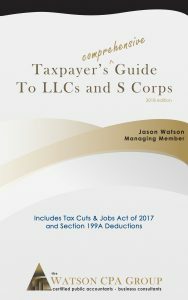 Each week we receive several phone calls and emails from small business owners and other CPAs across the country who have read our Taxpayer’s Comprehensive Guide to LLCs and S Corps and praised the wealth of information. Regardless of your current situation, whether you are considering starting your own business or entertaining a contracting gig, or you are an experienced business owner, the contents of this book are for you. This book is written with the general taxpayer in mind. Too many resources simply regurgitate complex tax code without explanation. While in some cases tax code and court opinions are duplicated verbatim because of precision of the words, this book strives to explain many technical concepts in layperson terms with some added humor and opinions. We believe you will find this book educational as well as amusing. How does all this work? Talk to us today to not just get started, but to get started on the right track!